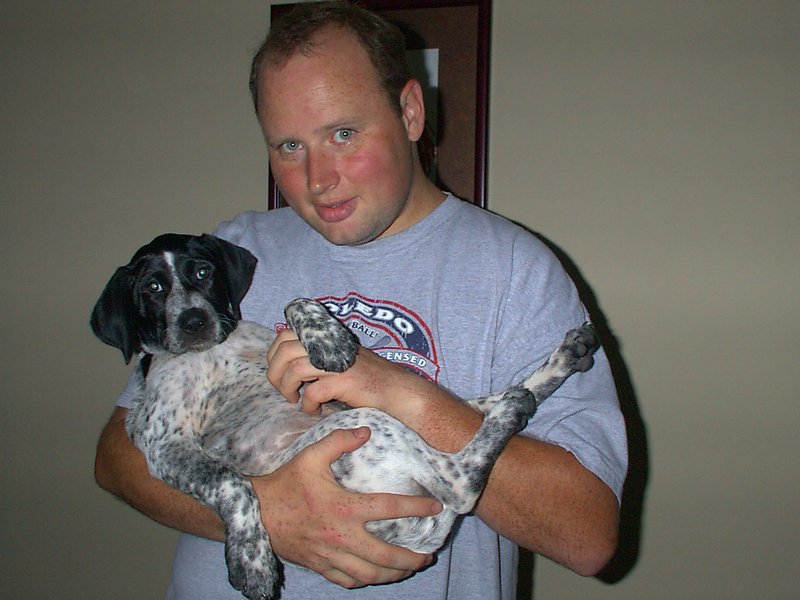 Greta, the day I brought her home in 2002. 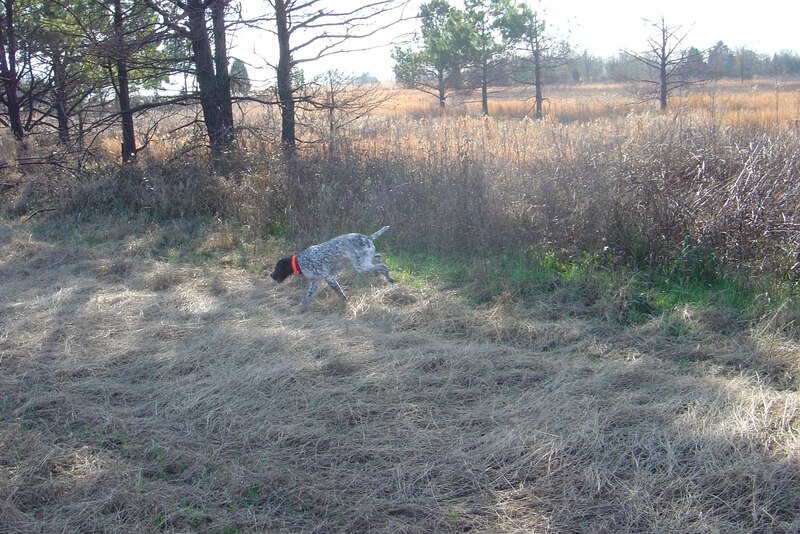 Like many moments that somehow change your life forever, I ended up the owner of a bird dog entirely by chance. 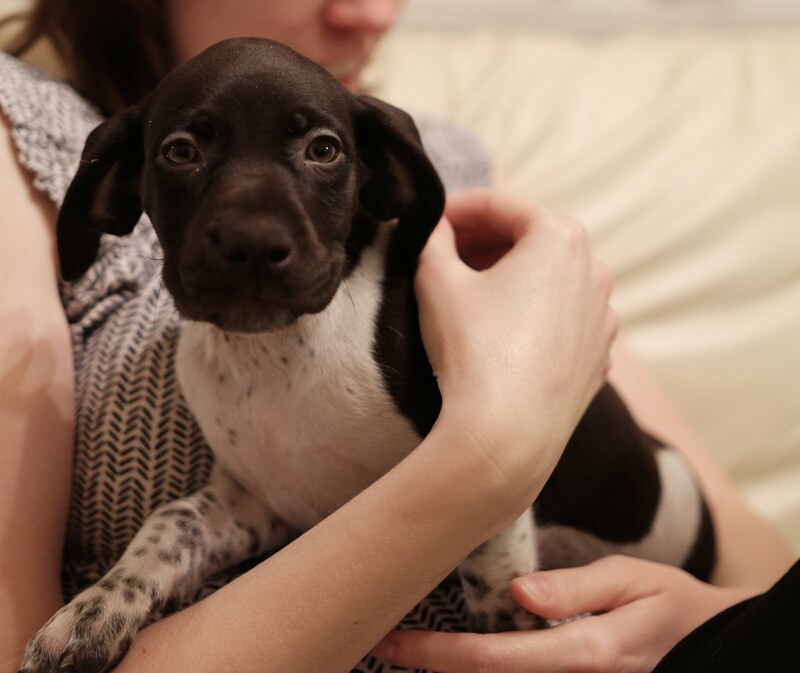 An acquaintance whose father-in-law’s hunting dogs had a litter called to ask if I would like a free German Shorthaired Pointer puppy. I wasn’t familiar with the breed, but he emailed a few pictures of these adorable black and white speckled pups. Since I was an active hunter, their sporting qualities held appeal, but I have to admit that the photos are what melted whatever resistance might have remained to the idea of getting a dog. Greta was just five weeks old when she picked me out. Three weeks more and she was riding home in a cardboard box on the passenger seat of my truck, the first of our many long trips together. Pulling into our driveway, her face popped over the rim of the box expectantly and she looked around. Then she silently puked out a giant steaming ball of vomit that in seconds slid greasily downward between the seat and the console. This was love. on the nature of time’s passage. People who say that raising a puppy and having a child are nothing alike must be on drugs or simply don’t know any better. 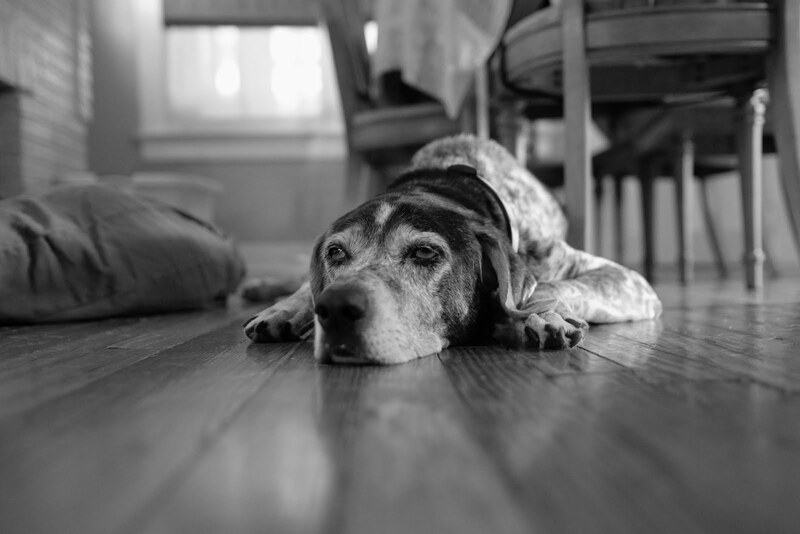 It is true that dogs spend their lifecycle on a compressed timeline, one that contains distinct infancy, toddlerhood, childhood, adolescence, adulthood, and geriatric phases, each with its own rewards and challenges. I’m glad I learned from my mistakes and successes with a dog before becoming a parent. 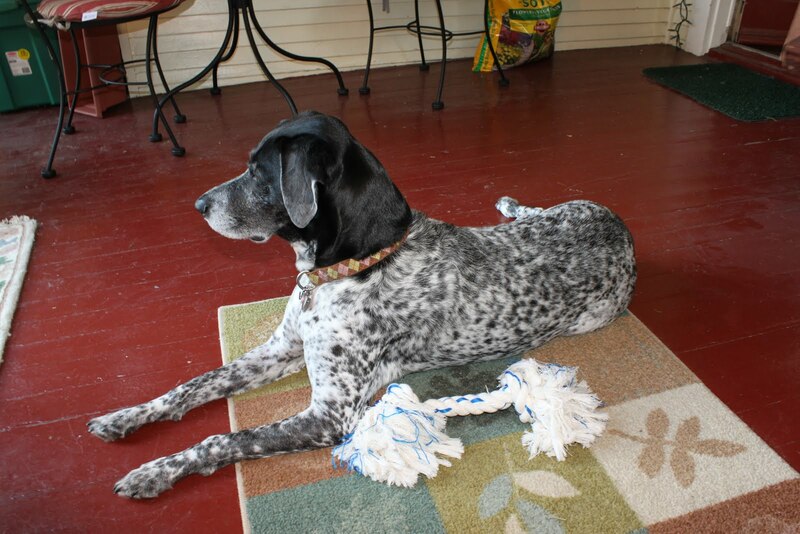 In fact, anyone wanting children should first try to train a strong-willed breed like a German Shorthaired Pointer. Greta helped transform me from the rootless twenty-something that I was into the stable thirty-something that I became. We shaped each other. 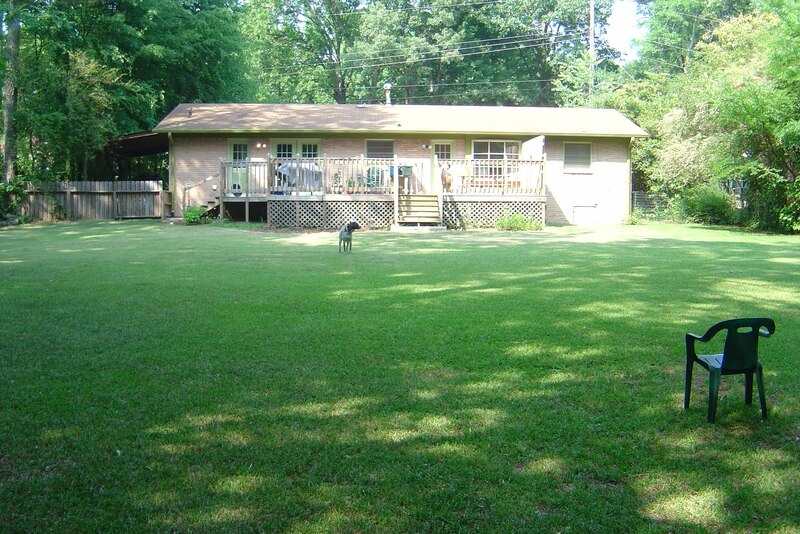 The house I owned in Athens, Georgia during graduate school. in this wonderful back yard? Great times. Consider that it was no problem at all for me to adjust to the fact that my son is part rooster, rising always with the sun – often before. Pointer parenthood readied me perfectly for this reality because pointers know that sunrise is an appropriate time to wake. Greta had two primary methods of getting me out of bed. One involved hopping up next to me, wedging tightly against my body and then leaning heavily against my chest. This technique failing, she might bodily sit upright on my stomach and then use her paw to poke me assertively in the chest. Adult Greta weighed between 65 and 70 pounds. When my eyes opened, her entire hindquarters would wag to signal her victory: It was time for a walk. How could I not realize this? Anyone with a toddler will recognize the futility in opposing such a force. 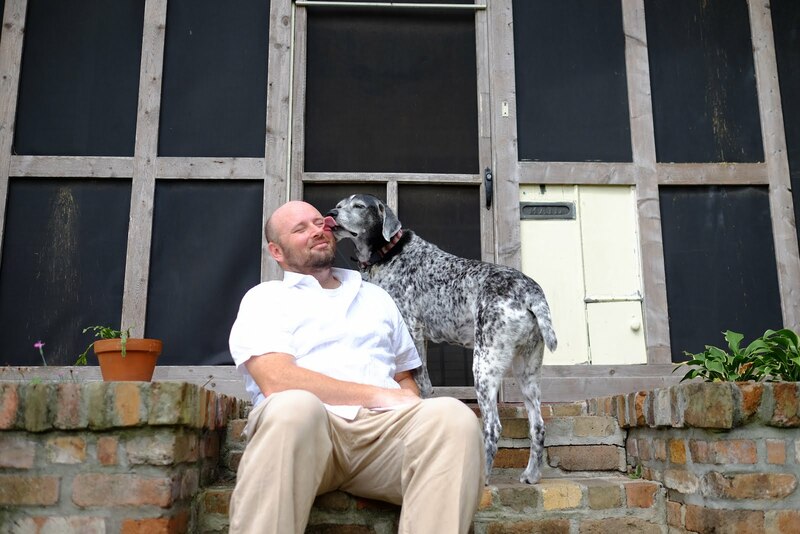 German Shorthairs are sensitive dogs. Some use the term “Velcro” to describe their penchant for being near and often touching their humans. They are also capable of expressing remorse in a deeply theatrical manner, with ears drooped and head bowed guiltily in a sideways glance. I grew up in a house with yelling. I never liked it, but this did not stop me from picking up the habit. Yet for all of its ubiquity in human life, yelling is deeply useless in dog training. Dogs have excellent hearing. No need to raise your voice. I had been demolishing a bathroom in my house one afternoon when Greta was still a puppy and had cut open my arm badly. There was much yelling, including that oath. In the process of cleaning and bandaging my arm, however, I became aware that the normally omnipresent Greta was nowhere to be seen. Strange. Nor would she come when I called her. I eventually found her cowering in a corner behind a recliner. She was beginning to train me. Yelling had to go, and so it eventually did… unless she was about to run into the road. Saving one’s voice for when it really matters was an early lesson. Greta had a lot of funny habits. and going to the farm. When I got my first academic job at Georgia Southern, she would ride back and forth the 3 hours between Statesboro and Athens in the backseat of my Subaru. It was a pleasant drive through the country, and I’d lower the windows in back so she could flap her jowls in the wind as we whizzed past acres of cotton. In the dry fall afternoons, the wind would generate so much static electricity in her coat that she could shock me with her wet nose, often on the back of the neck or ear as I drove. It never ceased to surprise either of us. On one occasion she hit my flip phone while I was talking on it and the shock from her nose killed the phone completely. I didn’t care. We enjoyed each other’s company. we lived. The chipmunks here bedeviled and amused her. 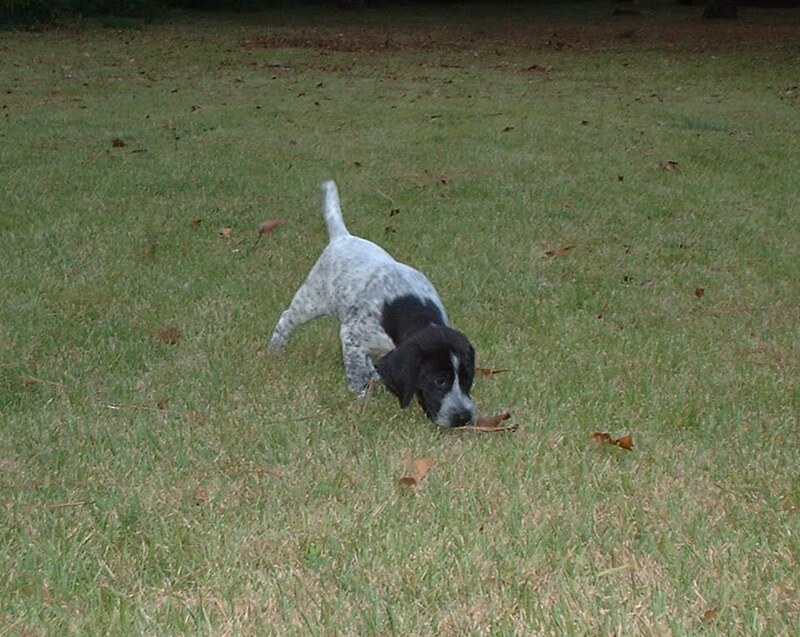 As a plantation dog, Greta was literally born to hunt. When around game birds, she was like a machine. I’ll never forget the first time she heard a pheasant; a dozen generations of breeding kicked in, and every fiber of her body became focused on the task at hand, her body a collection of angles and straight lines. But she also liked to point squirrels, cats, and domestic ducks and geese. During summers in New Orleans, I would take her on a thirty foot lead in Audubon Park in the early morning where she put on a show with people stopping on the jogging path to watch her stealthily close in on the birds, her head panning side to side like a security camera. She was quite a sight always until her hips no longer allowed her to stalk. 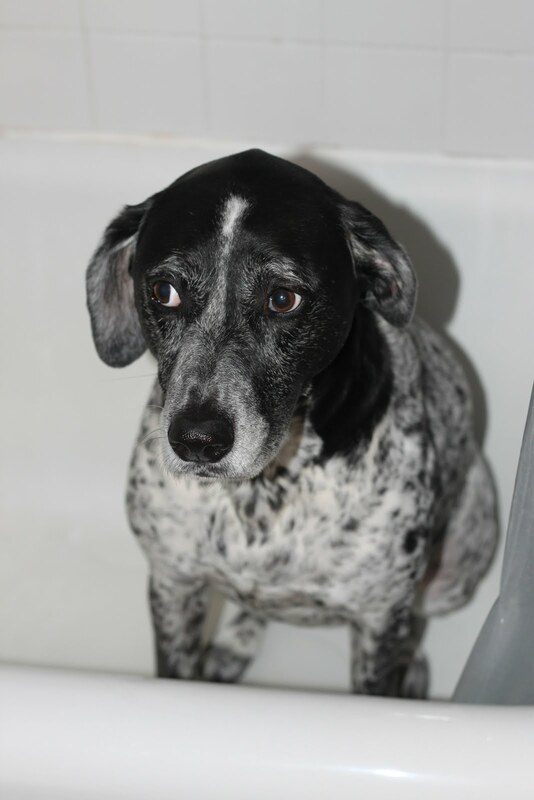 It’s hard to say what Greta hated more: baths or metal under her feet. One time my buddy Frank and I put her in an aluminum boat to go fishing down at the farm in Warren County, Georgia. I’d parked my Subaru near the shoreline and had left the windows down. By the time we’d rowed to the middle of the pond, Greta decided that she just couldn’t handle the sensation on her paws any longer, causing her to jump overboard and swim back to land. 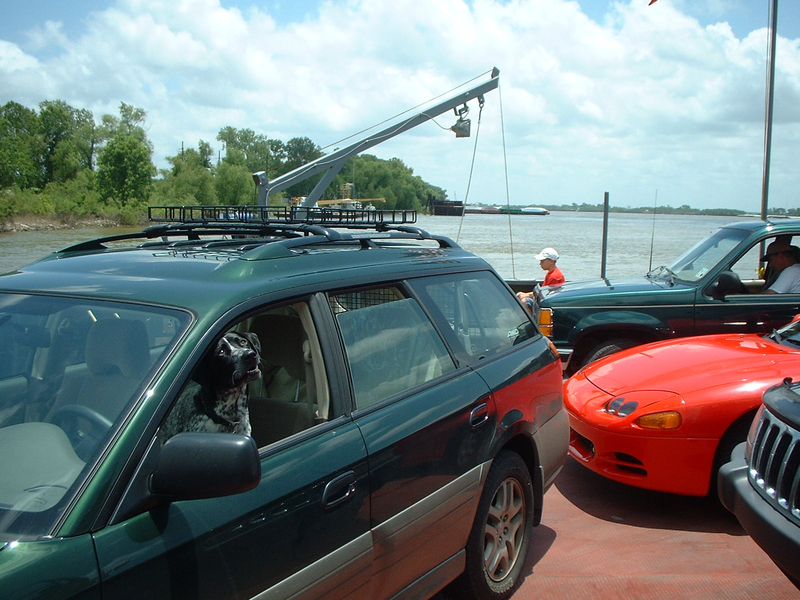 From there, wet and nasty with pond funk, she jumped into the driver’s seat of my car where she sat staring at us indignantly for the entire rest of the time we spent on our ill-fated fishing trip. Even your best friends have lines that shouldn’t be crossed. back then both in excellent shape! We moved to Blacksburg, Virginia in the summer of 2005. Greta was in her prime back then, having just turned three. I rented a four-room cabin made from hand-hewn poplar logs that stood on the side of a mountain. It was as rural as I’d ever lived or would ever care to live again, but Greta loved it. Our morning walks now involved a long, fitness-inducing loop up the side of the mountain. She could growl at deer that walked past the cabin’s windows and snap to attention at the call of a wild turkey. There was also snow. 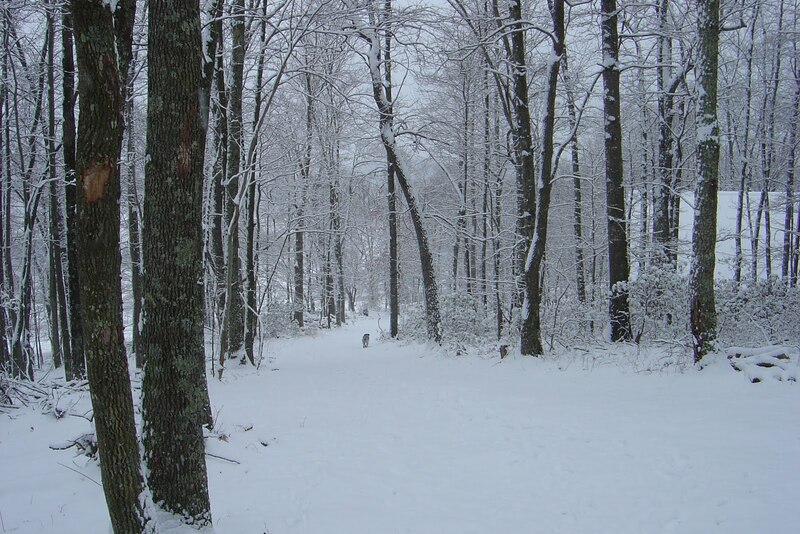 In fact, this part of Virginia gets very cold and the cabin’s only source of heat was an inadequate propane stove. Cold winter nights left me feeling like one of those nomads from an earlier age who slept cheek-to-jowl beside the campfire with their critters to keep warm. On these occasions when the cabin would get no balmier than the low 50s, you could find us beneath every blanket I owned, with only her black nose and the tip of a hind paw poking out from under the covers. Sometimes the ulterior motives of others are also in your best interest. Until very late in life, Greta could be insistent about being comfortable and warm. Yet for all that was memorable about my time teaching at Virginia Tech, it would be forever eclipsed by the April 16, 2007 shooting on campus. It is impossible to convey the unchained from reality nature of such an experience, and I’m not going to try to do that here. It was the second worst thing I’d endured in life. Probably the smartest move made by the university in the following week was to have all the students come back for one last day of the semester. Most of my kids did return, and I brought Greta to my southern history class. It was clear in that moment that the unknowing affection of a dog is worth more than all the well-intentioned human sympathy in the world. I can still see her climbing into the lap of a particular student and licking his face. The effects of such a traumatic event do not subside easily, and even still creep up behind me. Survivor’s guilt is a ghost who stands at your elbow, often at festive gatherings or maybe in the dead of night, times when you feel equally alone. But dogs do not regret. Tomorrow is just another day to take a walk and sniff pee-mail. Greta may have had a brain the size of a lemon but she was smart enough to know that you can’t change yesterday. Orleans. A youngish dog still, even with a little gray. With the help of some good friends, Greta and I moved down the hill to Greensboro, North Carolina later that summer. She had already put up with one relationship and was probably ready to not share my attention when later that fall I met Jess, the woman who would one day become my wife and the mother of our son. Greensboro will always stand out as a special place for me, a time when I went from the worst of times to a life better than I might have thought possible. It was not without challenge, however. When Jess’s dad was diagnosed with advanced esophageal cancer in December, our relationship entered a new phase. Greta, of course, would play an important part in the unfolding story of our lives. On New Year’s Day of 2008, we stopped at Jess’s parents’ home after a holiday visit in Athens. All of her immediate relatives were there, and they all got to meet me as well as Greta for the first time. This included Jess’s three year-old niece, who, afraid of dogs, let out a bloodcurdling scream upon seeing the terrifying visage of one black and white ticked pointer. Yet she and Greta had become the best of friends by that evening, the canine fear conquered. Greta would return with Jess and I for all but two different weekends between that day and her father’s death around Easter time. She loved being there among them, out in the country, and they loved having her come, especially Jess’s dad. Greta was not one to sit and be petted, but I can still see Harry now in his recliner smiling and holding out his hand as Greta passed under it. Dogs somehow know to be there when you need them most. Greta also loved patrolling their seventeen acres, right up until the day that Jess’s mom moved to a more practical house several years ago. Giving me one of her signature kisses on her 13th birthday. It is pure mythology to suggest that dogs are inherently good judges of character. As my friend Ken is quick to point out, “Hitler was a dog person.” But Greta distrusted only three people in her life. One was a shady door-to-door salesman who came to my parents’ house one time while they were dog sitting for me. Another was a sketchy individual for whom Greta’s reaction caused my friend Marsha to reconsider leasing her property. A third is someone with only tangential presence in our life but whom I distrust and dislike immensely. Each of these individuals received a growl and raised scruff, something a deeply unusual reaction for Greta. Generally she liked everyone, and generally the inverse was true. Those that did not pass her test did not pass ours. Mooching, and as a consequence, still in the game at 13. 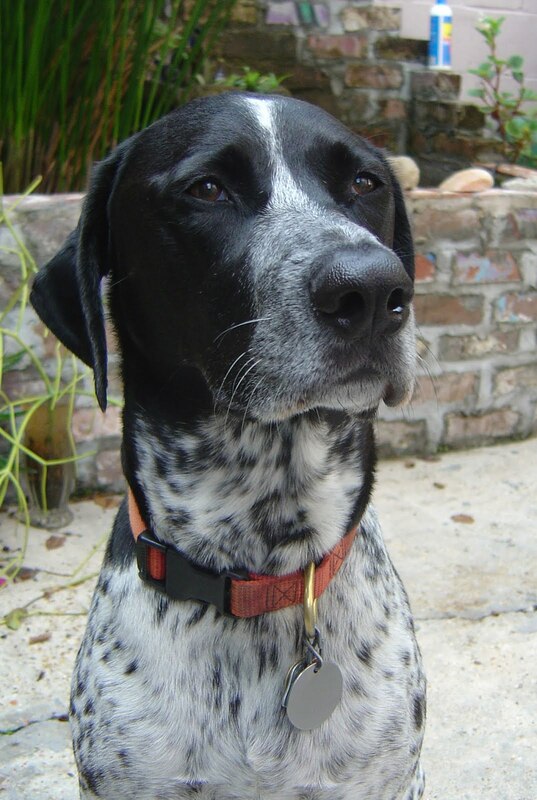 I say this, of course, recalling that there was a particular dog in our New Orleans neighborhood that she absolutely wanted to kill. She knew the sound of its collar jingle and would wake from a sound sleep upon hearing it from several blocks down the street just to bark like a maniac at this dog. We would joke about her imagining herself building a machine gun nest in the front yard to lay in wait for her prey. I always felt terrible about it, and the owner of the dog is a nice person. Greta probably gloated at outliving that dog. But no dog or human is perfect. Greta lived out her final years in New Orleans. It is funny how I always thought of her as an older dog when we moved here and yet she was only seven at the time. But she gave us another six more years, and we cherished them all. She loved jaunts in our beautiful part of Uptown. Anyone who walks their dog regularly in the morning already knows that it allows you to understand your neighborhood in a way that non-dog people never will. Jess would always marvel at my command of the names so many of the people or dogs around us. Of course, in the time we enjoyed with Greta in New Orleans, I probably walked past their houses a couple thousand times. To a dog, nothing is holier than routine. The last picture I ever took of Greta. Sweet ol’ gal. As she aged, Greta came down with medical conditions that expanded the knowledgebase of our wonderful and experienced veterinarian. She couldn’t keep it simple. Eye surgery and a weird form of lupus that gave her sores on her paws were the most serious. 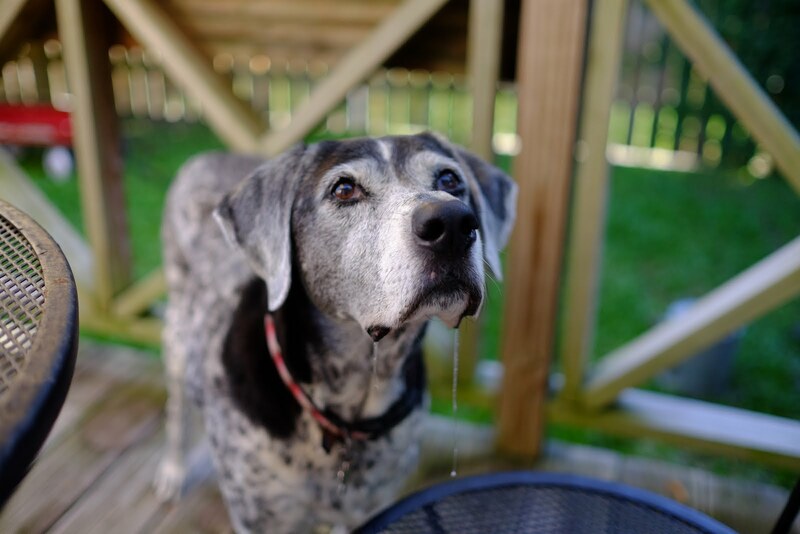 She had a couple of near-misses after the age of eleven, but the time inevitably came when we had to say goodbye. In my mind I’d always hoped she would go in her sleep. But life isn’t often so easy. It was an end I would not choose, and we were heartbroken when she wagged at the vet when she came to our house for this last visit. The technician later helped me wrap her body up in an old worn-out duvet cover on which we had napped together so many times (in those pre-baby days when one might nap!) 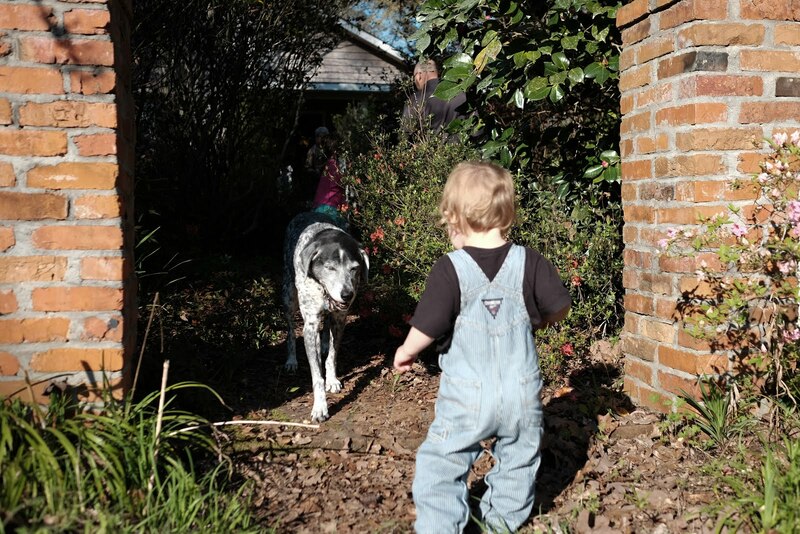 and I carried her up to our friends’ farm in Mississippi, a place that she had loved, and here I buried her among a beautiful grove of camellia bushes. It was as physically and emotionally demanding of a day as I’d known. For a moment I considered calling Jess to let her know that I’d spend the night at the farm, undoubtedly availing myself of our host’s ample liquor supply. But she was sad too and we were to comfort each other. Besides, my son needed his bath, and that is my job. No drinking was happening until he was in bed. Routine mattered. I think Greta would have agreed with this, despite knowing well that dogs can grieve. Greta last spring at the farm in Mississippi with my son. She loved the farm, a rural idyll. I like to think of this picture when I remember her. A few nights later, still very depressed about what we’d gone through, missing Greta terribly, I listened to a morbid discussion in the car on NPR about people who cook regularly and who must take care of a dying loved one. Apparently when humans are ready to go, we quit eating, and this is hard for the caregiver, accustomed as they are to using food to show love. In health, nobody mooched harder than Greta. And she mooched well past her thirteenth birthday. I once joked that “mooching was living,” to riff off of a line in a Son Volt song, but it was so very true. I’d been cooking chicken and rice, beef, and all sorts of other tasty treats for Greta as she declined. For at least two months, in fact. At first a pleasant novelty, she began rejecting my cooking. It was frustrating and so inexplicable for a dog about whom I often suggested had a chicken surmounted by two strips of bacon as a coat of arms. Not eating almost anything for two weeks was Greta’s way of saying she was done. It still wasn’t easy, but some things never are. It turns out that accepting the need to let go would be the second to last lesson that this once-in-a-lifetime dog taught me. If there is any justice to the cosmos, she is running free now. 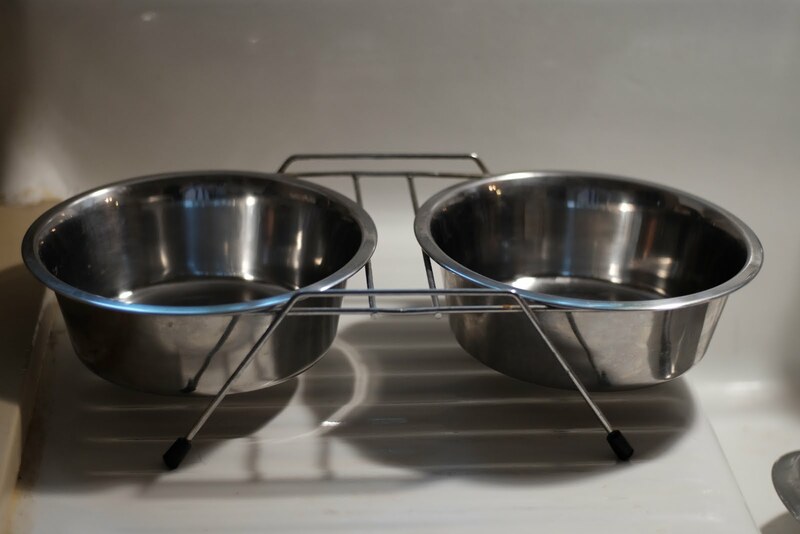 I’d bought a pair of nice stainless steel dog dishes for Greta when she was just a puppy, and she’d used them just about her entire life. They would shine up like new with Barkeeper’s Friend, so I cleaned them one last time. For about a month they sat on the counter until sometime in October when I worked up the nerve to put them in the attic along with her “Easy Rider” harness that she wore in the car. There they sat until we decorated our tree at Thanksgiving. I saw them as I turned a corner while retrieving our box of ornaments in the attic. Looking back on it a month later, I realize that this was a turning point. Lotte, with big pawprints to fill. She seems up to it. And so it life goes on, cheesy as it sounds, just as Greta knew to be true. That was her last lesson. I’d be lying to say that it hasn’t been bittersweet to downright difficult at times to deal with the brutally effusive love of another pointer. Lotte will ultimately be as much our son’s dog as mine, although they are still getting to know each other. Realistically she will teach him his first lesson about life’s cycle, about aging, about death and time’s stubborn forward advance. But she’ll also teach him about responsibility, loyalty, and love, all without even trying.